It was the master comedy playwright George S. Kaufman (Dinner at Eight, You Can’t Take It with You) who playfully but pointedly tagged politically engaged dramatist Clifford Odets after the opening of his 1938 play Rocket to the Moon. “Odets, where is thy sting?” Kaufman waggishly wrote, playing off a famous Biblical line. 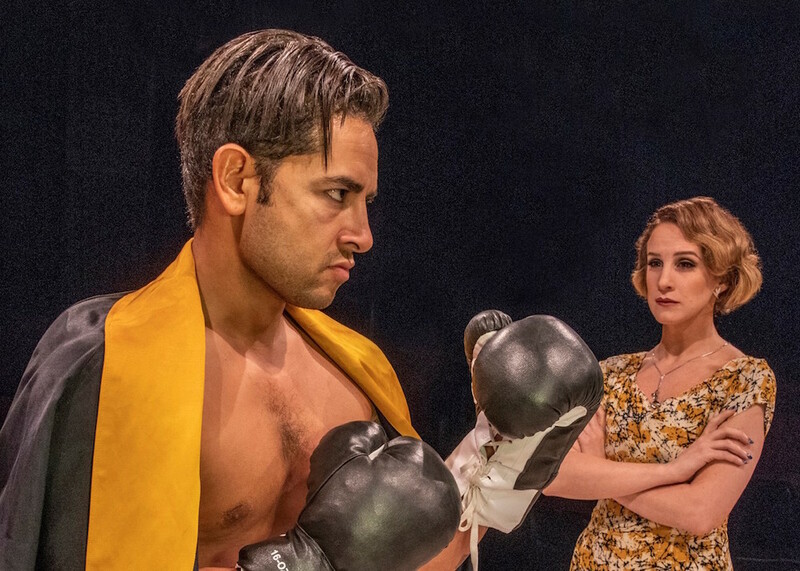 It’s a question that can spring to mind in connection with the Irish Classical Theatre’s current production of Odets’s 1937 play about conflicted desire and destiny, Golden Boy. Odets wrote it for the leftist Group Theatre, a company with which he has always been identified, although his varied career went on long after he left it. He has also long been regarded by many as passé, a period writer whose old-left attitudes and ideas haven’t transcended the tumultuous Great Depression era. The ICTC’s sometimes absorbing but uneven production provides ample evidence that this writes off Odets too carelessly and easily, reminding us of this play’s vibrance, bite, and sharpened feeling. It strongly implies Odets’s relevance in our own troubled era. Odets flipped the traditional narrative of the striving young artist who must buck a parent’s practical objections. Here, old Joe longs for his son to pursue transformative creativity even if the financial rewards are meager, but his hopes are dashed by Joe’s dissatisfaction and much ruder ambitions. Joe’s ascendent boxing career involves him with three people who will both help and betray him in their different ways: Tom Moody (Christian Brandjes), his down-at-the-heels manager; Lorna Moon (Cassie Cameron), Tom’s mistress; and Eddie Friseli (Eric Rawski), the gangster who menacingly muscles his way into part ownership of the young fighter. Throughout his career, Odets wrote about the pursuit and failure of the American Dream, the conflicts between social classes, and the disharmony financial success creates with integrity and self actualization. These concerns are in Golden Boy in spades. Odets often expresses them in his lyrically yearning style that’s often punctuated by hardboiled, pungent, semi-poetic dialogue. This play moves quickly, and Odets’s Hollywood influence is evident in the pace and in the script’s cinematic “fadeout” stage direction after a number of the short scenes. Historically, this style hasn’t been everyone’s cup of tea. I think it works when the appropriate mood is created. The ICTC’s production sometimes achieves this target and at others its aim is a little off. The able cast is mostly impressive but its tone can be a bit inconsistent with Odets’s. Gomez’s father is a standout. There’s a pathos and dignity in his performance, all the more impressive since he has to navigate his way with an Italian accent without sounding like Chico from the Marx Brothers. Cameron’s Lorna is mostly a success. She’s got the character’s mix of cynicism and longing down. Alcocer’s work is vigorous and heartfelt, although sometimes perhaps a little too robust. The battle for his soul that he feels inwardly occasionally can seem overwhelmed by too much forcefulness. All told, his version of Joe succeeds. At some points Fortunato Pezzimenti’s direction is a little more emphatic than necessary or advisable. At those few times the play’s melodramatic potential is privileged over Odets’s deeper felt, more subtle elements. But, if a few allowances are made, this production offers a rewarding experience, and for those who are unfamiliar with Odets’s work, an opportunity to discover a still resonant and relevant artist.